The question of "Is enjoying Japanese manga and anime an unpatriotic act?" has been a great point of debate in China. The topic has caused many problems, and many young Chinese people are torn between their anti-Japan feelings and their love for Japanese manga. One college student once posted on a Chinese bulletin board: "I don't want to be unpatriotic, but I can't help but watch Japanese anime. What should I do? Please give me some advice, I'm really under a lot of stress." In 2006, a Chinese newspaper called Global Times published an article titled "Beware of Japanese Manga Misleading the Next Generation" (the article was later posted on the internet). The article triggered fierce response, many people asked: "Why blame Japanese manga?" The reason Japanese manga has a dangerous influence on the next generation is not because it's promoted by the government or because of some extreme works. The reason is that the entire Japanese manga industry is using manga, a medium that appeals to children and young adults, to unconsciously push Japan's way of thinking, values and the concept of right and wrong, good and evil into the minds of children from other countries. The article goes on to say that manga itself is good; it's just that most manga from Japan are being used in a wrong way. The writer concludes that China should be on alert for manga from Japan, and that China should battle this cultural influence by producing its own original and "healthy" manga. Many writers responded by pointing out the difference between enjoying a manga and believe what's in a manga. Most modern Japanese are based on a fictional world, a world that people want to escape to. "Japanese manga show Japanese people's desire to escape into a different world, such as their desire to move to Europe, which is why many characters in manga look more like European than Asian." It's perfectly normal to better understand these ideas and values by reading manga, which act as a mirror to another culture: "To have gain an understanding of Japan, it's better read manga than to read some third class sociology book, provided you read manga from an objective point of view and don't believe everything the manga has to say." "Manga is a privilege available to everyone, works like Doraemon and Dragon Ball carried the dreams of millions, and continue to be popular even today." During the discussion, a point was brought up: "If we block ourselves out from Japanese manga, what else do we have?" It has been a known fact among Chinese fans that China lacks its own original content, and what China does have can hardly compare with their oversea counterparts. According to one writer, people can't even name three original Chinese products that are both popular among children and have positive influence on their growth. The scary face above is a character from the popular manga Death Note, which was recently adapted into a movie. This movie experienced remarkable sales in Japan and China, many young people (including me) are into this movie. 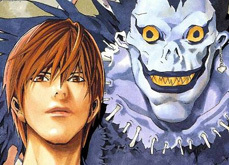 Because the Death Note movie is based on a manga, many angry comments appeared on bulletin boards criticizing the movie for being associated with a Japanese manga. The comments accused fans of the movie/manga, including myself, of being unpatriotic, that we prefer foreign goods over Chinese products. However, I want to ask the attackers: "While you're attacking us, aren't you all impressed by the movie as well? How often have you talked about Death Note?" Please calm down and stop attacking those who love Japanese manga. Just because I enjoy Japanese manga doesn't mean I have betrayed China. People are accusing others of being unpatriotic without stopping to consider the quality of the manga. These people are shortsighted and their attitude exaggerated. I would like to ask them: "Do you have any foreign products around you? Have you ever eaten any imported foods, and used any foreign products?" As our forefathers once said: "Learn from the enemy in order to expel the enemy." So what's wrong with trying to surround ourselves with things from overseas? Then there are manga imported from Japan. It's true that when China and Japan fought decades ago, Japan committed many inhuman acts, but are war and manga related in anyway? Does it mean China will stay away from Japanese manga because Japan invaded China? Germany also invaded China once, so should China ignore Adidas clothing? America is no good, so should we block NIKE shoes? Now we're enjoying Japanese manga and American movies, it's not an unpatriotic thing, we just want to enjoy good products. Who are the real patriots? I think we are more patriotic than those who abuse others. Think what our country needs, China needs to be developed, and all countries need to learn from other countries. While Japanese manga and anime are not perfect, people shouldn't see matters from one side only, it's meaningless. I hope they will be able to enjoy Japanese manga. Don't worry, we won't forget the war from decades ago, we are not betraying our country. Submitted by Estara (not verified) on Mon, 2007-05-14 10:14. When did Germany invade China? We invaded lots of stuff during Hitler's times, but we were lousy imperialists, mostly because the other European powers had been there first while the German Empire was fighting amongst its many kingdoms, dukedoms and whatever. Now on the other hand we have the opium trade via the British, if I remember correctly. ^^ Germans are used to being the historical bad guys on the internet but at least accuse us of a crime we've comitted. Submitted by N_ (not verified) on Mon, 2007-05-14 14:54. I think the author in the quote was referring to the Eight-Nation Alliance during the Boxer Rebellion. Even today many Chinese still hold a negative feeling toward the whole ransacking and pillaging caused by the nations involved. Of course, I think in this specific case, the author of the article picked Germany mainly for the Adidas-brand recognition. Submitted by Estara (not verified) on Tue, 2007-05-15 06:43. Now that makes sense, that our wannabe imperialists stuck their guns in with eight others, so they could say they had been part of it, too. Thanks for clearing that up! Submitted by Anonymous (not verified) on Mon, 2007-05-14 18:02. I was born into a Chinese family but for the most part raised in England. I have to say that this anti-Japanese thing had never rubbed off onto me, but I see it in the eyes of older relatives, some not so much older. Some fought in wars against Japan years ago; I guess I can't blame them. But usually it seems so childish to me, and also hypocritical, because I bet they'd get along with any Japanese person anytime (if they could understand each other, no problem for my dad in England). And if that person just happened to be a mangaka... well, maybe then they'd see these manga authors as humans, not monsters of propaganda (ok, slightly exaggeration). I don't think (m)any mangakas create stories in order to influence the public. Maybe someone will get offended by something. Sometimes people are just inconsiderate or plain ignorant. I bet there are plenty of things we could ridicule wihout a second thought with nobody around us caring, but a better informed person might. Wait a minute. They're implying that the Japanese concept of good and evil is drastically different from China's. That is a bit worrying. Most things I've read in (good, mainstream) mangas seem pretty moral and good, sometimes even wise. What are thy harping about? This anti-Japanese thing has got to go if China wants to move forwards. Unpatriotic? I'm not very knowledgeable about any of this, but that makes them sound insecure of the people. There are plenty of things about China to root for!! Submitted by Anonymous (not verified) on Wed, 2007-05-16 02:57. That is so true, and no way works like Doraemon are trying to "corrupt" children from other countries. I am the real Anonymous. Submitted by Anonymous (not verified) on Tue, 2009-07-28 11:26. I am the real Anonymous. 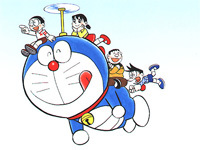 Anyhow, I believe manga like Doraemon serve the same purpose as comics like Superman. They are just here to entertain people, often children but teenagers and adults included. It really depends on the manga. Manga like Death Note are filled with convoluted theories and arguments that require some thinking to understand (mostly just paranoia on Light's part), while others such as Dragon Ball are very simple in vocabulary and plot. I don't see while traditional American comics like Batman are more widely accepted than manga like Hunter Hunter. They're equally violent and bloody. Although there is an anti-Japanese feeling in China, there is also (to a lesser extent) an anti-Japanese feeling in American, particulary among veterans who fought in World War II.